Ideas, imagery and Meglos (1980) | Randomwhoness: a Doctor Who blog by Johnny Spandrell. Sampling stories in random order. In an alternative universe (such as the one we’ll be heading to next random), we’d be talking about this as the first Meglos story. Yes, Meglos, that mostly mocked one note joke of a Doctor Who villain, a talking cactus of all things, could have made a comeback. Writer Gareth Roberts wanted to include him as the bad guy behind shenanigans in the Matt Smith story The Lodger. Whether this idea bit the dust because it was too ridiculous, too self-referential or because bringing back a rubbish monster as a statement of irony wasn’t the best idea to start with, is kind of irrelevant. The point is, Meglos lingers in our Whoish memories. Why? Well, two reasons, I think. Reason one: because within the schlocky fiction of the piece, there are some interesting ideas being almost talked about. Doctor Who has often presented the conflicts between science and superstition, and between science and magic. It rarely wades into the dangerous waters of comparing science and religion. So it’s an unexpected reminder to find it popping up in this inauspicious story. The Savants see the planet’s mysterious power source, the Dodecahedron, as an artifact to be analysed and its potential tapped. For some reason, they also see hair as being best hidden under shockingly white wigs, cut into bobs and plastered on their heads, so their judgement is called into question from the start. The Deons believe the Dodecahedron to be a gift from the great god Ti, and thus the subject of reverence and worship. We only really meet one Deon, the majestic Lexa (Jacqueline Hill) and she wears her white hair in an outrageously long pony tail. Good hairdressers are obviously hard to find on Tigella. ZASTOR: Some fifty years ago, I knew a man who solved the insoluble by the strangest means. He sees the threads that join the universe together and mends them when they break. DEEDRIX: A savant? Or one of her madmen? ZASTOR: A little of each and a great deal more of something else. It’s interesting that Zastor positions the Doctor halfway between science and religion. Religion has never been his bag, but science most definitely has. The Doctor is described as a scientist regularly throughout the 60s and 70s eras, but Season 18 is the last to emphasize this side of his nature. After this season, he becomes an adventurer and a traveller. Has the 21st century version of the show ever described a him as a scientist? Part One: while your villain hires some henchmen and explains his plan, and you introduce the setting, your supporting characters and their main non-hair related problem, contain the Doctor and his friends to the TARDIS. Part Two: while the villain travels and arrives at aforementioned setting, continue to delay the Doctor getting there by letting him land halfway through the ep, and then some distance away from the action. Split him up from his companions. Have the companion keep some henchmen company for a while. Part Three: Have the companion keep those henchmen company for a while longer. Have the villain complete his plan, but hang around for a bit to talk to some minor characters. Have the Doctor slowly take all episode to work out what’s going on, while the villain escapes. Part Four: Doctor and co chase the villain back to his base. Doc turns table on villain with some rudimentary bait and switch. End with explosion. 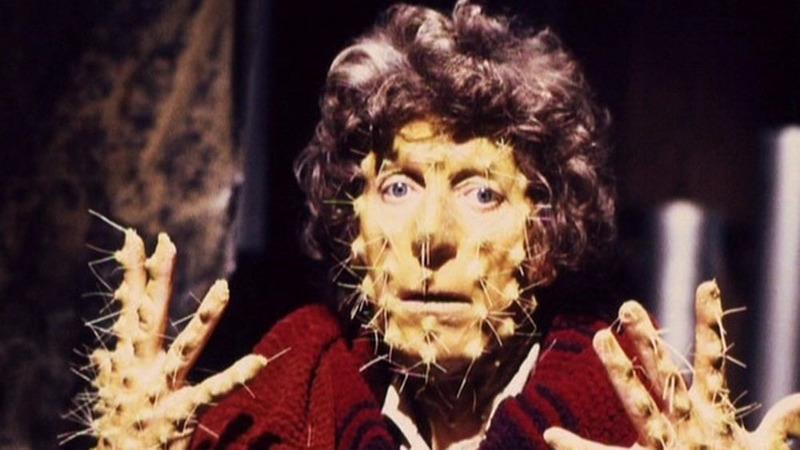 Reason two: Tom Baker in cactus make up. Meglos has an ace up its sleeve in that it’s got a brilliant lead actor to play the villain: Tom Baker. In some ways, there’s no more qualified person to play a Doctor Who villain. After all, at the time of recording Meglos, Tom had seen at least 36 people play Doctor Who villains up close. He knows how it’s done. He seems to relish being Meglos, playing him utterly seriously, if just on this side of melodramatics. Everything we’ve heard about how temperamental Tom was getting towards the end of his time on the show tells us that he should have been bored out of his brain playing this ranting bad guy. God only knows what he said when they told him they were going to make him up like a cactus. Actually I have a theory that when he saw how good that cactus make up was, he realised that this was going to be the scene stealer of the show, so if anyone was going to wear it, it might as well be him. It’s a terrific effect, this green, spiny Doctor, and gives this last Baker year a vividly memorable image to match any of the previous 17. There’ll be many a fan, young at the time this story went out, who remembers the Cactus Doctor, struggling to contain the rebellious Earthling (Christopher Owen) within his spiky body. It’s a much better look than either of Meglos’s other forms; a dull, plasticky cactus prop, or later when he’s defeated, a giant sized snot rag, scurrying across the floor. At least Romana’s impressed at the transformation from Time Lord to mobile booger. ‘He must have modulated himself on a particular wavelength of light… that would make him virtually indestructible!’ she helpfully explains. See, even then they were thinking about Meglos 2. Or The Meglos in the Room Upstairs. Or perhaps a spin off series: Meglos & Company. Presumably that’s the line upon which Roberts was going to hang the premise of Meglos’s return. Maybe it’s not too late. Peter Capaldi sporting that spiny cactus make up? You can see it can’t you? That Meglos, you know, he can modulate himself on a particular wavelength of light. He’s virtually indestructible. LINK TO School Reunion: both feature the return of actresses who had played the Doctor’s companion. And they both have K9 in them. NEXT TIME: The sound of a planet screaming out its rage! Welcome to the Inferno.